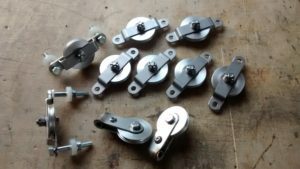 It’s time to make some pulleys! Pulleys are used for flight control cable routing. For EC Goat cables actuate elevator and rudder controls. Air block pulleys. 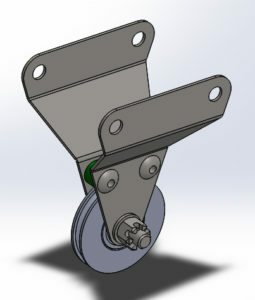 They are attached to the structure with a single bolt and can rotate around it. 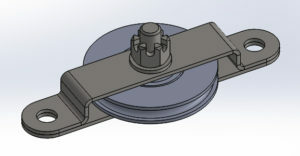 Two such pulleys are used in front part of the nose section for elevator cable reversing. 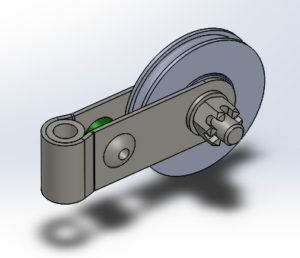 One air block pulley is used for rudder pedal link. 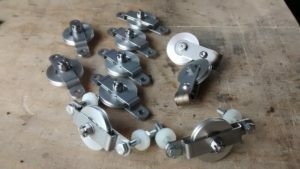 Pulleys themselves are commercial MISUMI idlers for round belts type MBFA30-1.6. Block brackets are made of AISI304 steel 1mm sheet by laser cutting and bending.